Welcome back to our Study and Exam Skills area! In this short animation, we're bringing you a range of practical tips to help you with academic reading. Lost in a sea of difficult texts? Studying... 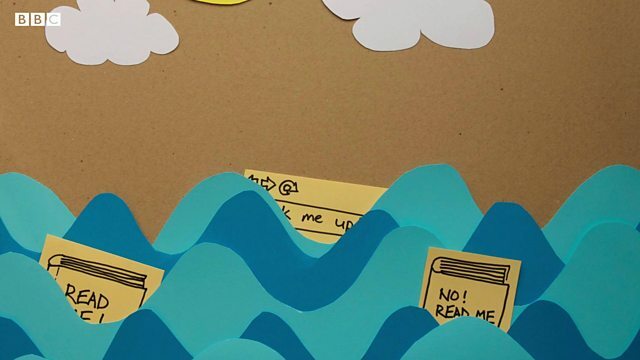 It can feel like you’re in an ocean, lost in a sea of books and resources. And when you finally find the right book, reading it is... mysterious. It’s full of new things. It’s intimidating. Scroll down to watch the video and find out how to read with confidence! Your map for reading success! Having trouble with reading? You need a map! You need to know WHY you’re reading. And you need to read in different ways: quickly and slowly, for different purposes. Watch this video to find out how. Watch the video. 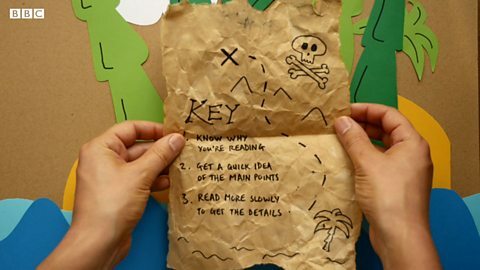 See if you can pick out the four main tips about reading (write them down if you like). Then scroll down to check your answers. Studying. It can feel like you're in an ocean, lost in a sea of books and resources. And when you finally find the right one, reading it is mysterious. It's full of new things. It's intimidating. You need a map. You need to know why you're reading. And you need to read in different ways: quickly and slowly, for different purposes. What's your purpose? Maybe you're just looking for information on one specific thing. For example: pirates! Are you reading for an exam? If so, check which bits of the course are being tested. Or for an assignment? Look at the question, so you can focus your reading. Have a quick look at the contents page. Found what you're looking for? Great. Now, here's a good tip: read the conclusions first. It's not cheating. Time is precious. Look at headings, images and summaries. And learn to skim and scan. Skimming is just reading quickly. If you see a word or phrase that looks important, you can slow down and read in more detail. Scanning means looking for specific words, phrases, acronyms and numbers in the text. Now you've got a better idea of the text, take your time to read relevant sections. This time, take notes as you go. Try to really understand what you're reading. Think about it: do you agree with it? Does it raise more questions? Keep a dictionary or glossary beside you, to look up key terms. And don't give up. Remember, reading difficult texts can be intimidating, but with practice, you'll get better. And if you keep going, you'll find treasure buried in the text. Even if it isn't a chest full of gold coins. Did you get all four reading tips? Check your understanding with this activity. Did you get all four reading tips? You need to know the reason why you're reading – true or false? Which of these features of a text does not give you as much information as the others? Do you only need to read quickly to be a good academic reader? What can you do to help you really understand what you're reading? You shouldn't do anything else when you are reading an academic text as it's too distracting – true or false? But before we finish, let's recap what we've learned about academic reading so far. Check to see if you identified all six pieces of advice. You need to know why you're reading – check if you're searching for specific information, preparing for an exam or an assignment. Read the conclusions first – it's not cheating! That way you will know if it will be helpful to read this material. Use features of the text to help you – check the contents, headings, images and summaries to gain a better understanding of the text. Try skimming (reading very quickly) – and scanning (looking for specific information like numbers, words, phrases or acronyms). Take notes while you read and really try to understand the text. Consider whether you agree or disagree with it. Keep a dictionary with you to look up key words. You could even make a glossary of key words and phrases. Visit The Open University to discover academic treasure – inspirational historical quotes about learning – just click on the link in the 'Where next?' section.